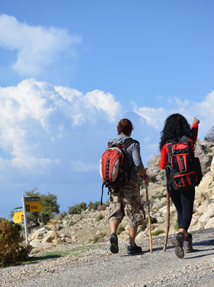 The trek starts in Fethiye and ends near Antalya in southern Turkey. 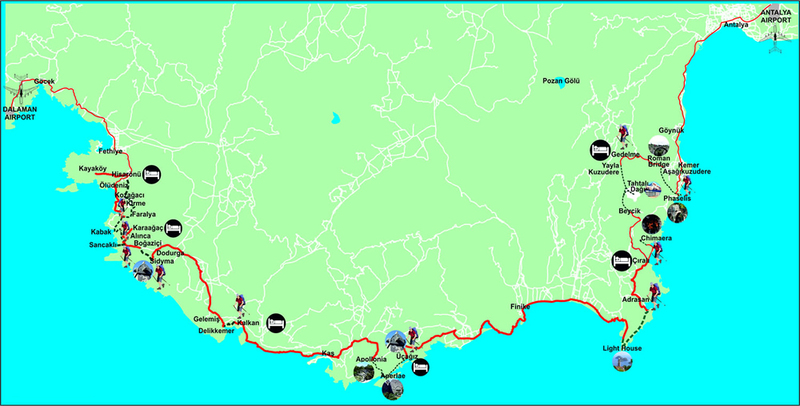 It is a little over 400 km from beginning to end, mainly following footpaths and mule trails. The route is graded medium to hard; it is not level walking generally crossing tufa or limestone, and involves a lot of ascent and descent as it moves to and from the line of the coast. This diverse and extraordinarily beautiful walk is well marked although sometimes overgrown which just adds to its charm.. The best time of year to do the trek is in the spring and early summer months, and autumn, when the land is alive and green, and the temperatures are most comfortable. Summers are very hot although walking short shady sections of the trek is a good option. Winters in the region are wet. 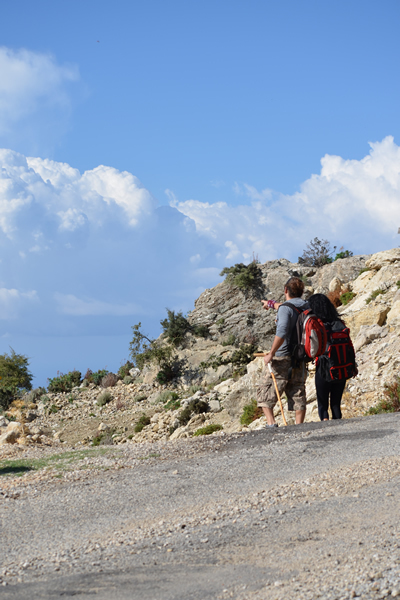 For more detailed info, Kate Clow's book, The Lycian Way, is an essential companion for both Lycian historical information and trail finding. 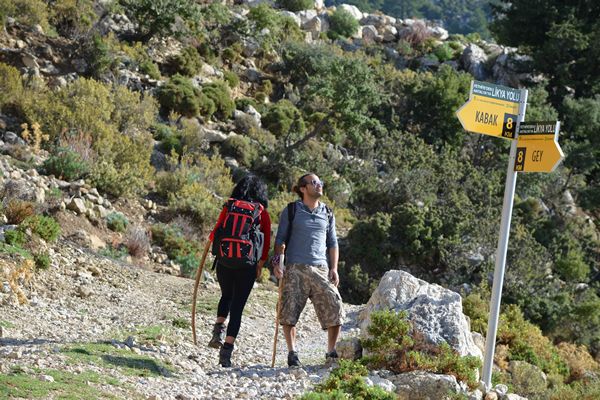 Hike down to Kabak beach along the Lycian trail (11km). 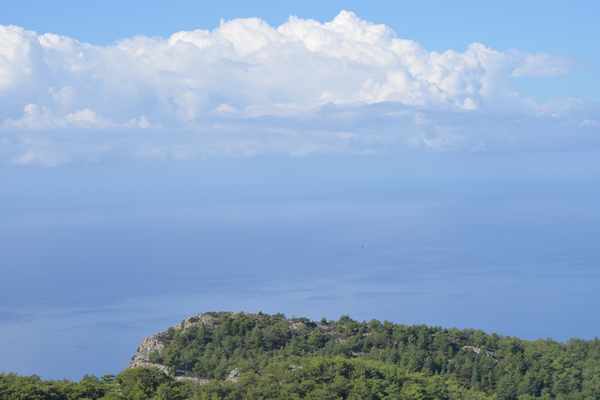 Trek to Kabak Beach (11km) and from there take a boat to St.Nicholas Island. Return via Gemiler Bay over land and visit Kayakoy and Levissi. Vehicle pick up to Blacktree. 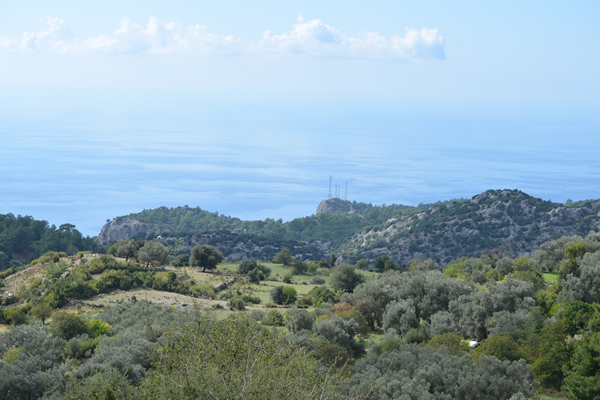 Trek along the Lycian Way to Kabak (11 km) with lunch in local Inn (3km) and vehicle pick-up to Black Tree. Trek to Pinara (11 km) with lunch in private local house. Vehicle pick up to Black Tree. 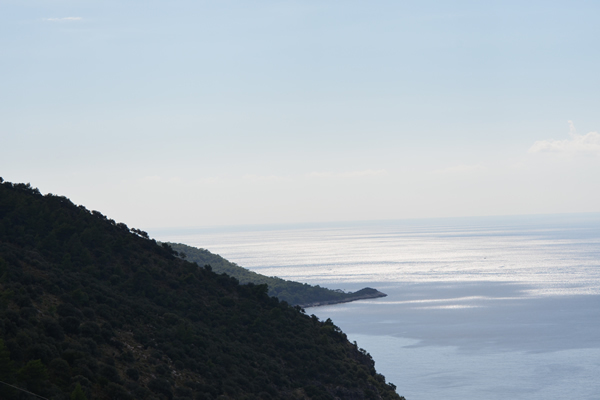 Coastal drop-off at Kabak Beach to walk the Lycian Way passing the Seven Capes and ending up in Sydima. 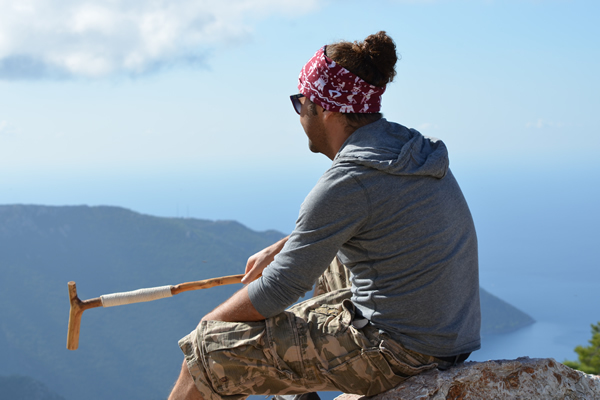 Walk from Alinca to Kabak Beach. Vehicle back to Black Tree. Ovacik - Kozagaci - Alinca route. Vehicle back to Black Tree. High above Oludeniz, Turkey’s busiest tourist resort, sits Black Tree Farm, an all-organic retreat presided over by an Anglo-Turkish family and populated by ducks, rabbits and goats. You stay in an ancient farmhouse or in one self catering cottages around the citrus and olive orchard. Kids can collect hens eggs and pet baby donkeys. The walk down to Butterfly Valley beach on the Lycian Way (a 300 mile hiking trail to Antalya), then a dip in the pool on return, will exhaust the most energetic of visitors. Family favourites ....Black Tree Cottages (blacktree.net) offer individual mountain hideaways with stunning views over the Lycian coast. They are set in a rustic haven crawling with farm animals, and excellently served with a pool and walking trails. With its unrivalled slew of historical sites, great scenery and underrated cuisine, not to mention an instinct for hospitality that makes rival destinations seem positively surly, Turkey has bags to offer. 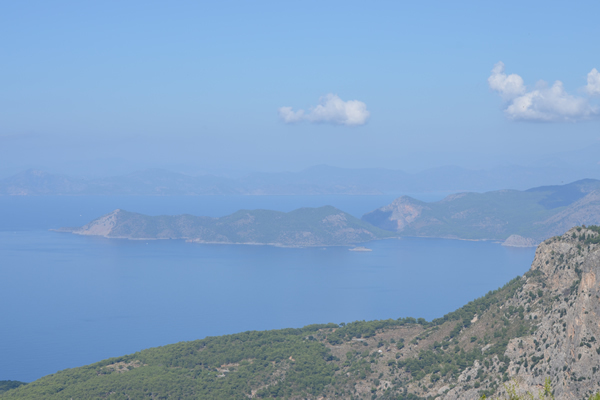 For that very reason, it’s been expanding fast, and some travellers have been put off by the crass overdevelopment around Oludeniz, Marmaris and Kalkan. 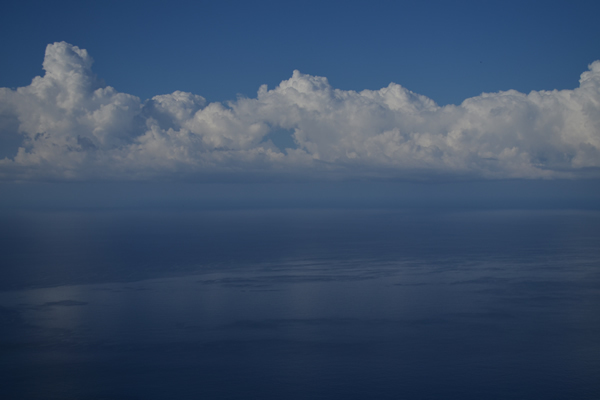 They’re missing out: the country extends far beyond these occasional blights. On unspoilt Mediterranean headlands, little-visited coves and remote hillsides, a new generation of imaginative and free-thinking Turkish and expat hoteliers is providing a range of holiday accommodation that could not be more different from the concrete hulks of the past.